The official start of the competition for the £2.75bn contract to design, build and maintain Britain’s next generation of high speed trains was launched by HS2 Ltd today. The successful bidder will work with High Speed Two (HS2) Ltd to develop around 60 state of the art trains to transport passengers across the country on the new high speed rail network and onto the existing railway. Hundreds of jobs will be created by the contract. HS2 Ltd will work with companies and suppliers to create opportunities for small and medium sized enterprises, boost skills and encourage a wide range of people to join the workforce. Britain’s new railway will carry over 300,000 people a day, improve connections between our great cities, free up space on our existing rail lines, generate jobs and help us build an economy that works for all. But what will make HS2’s reputation from day one will be its trains. It is a given that we want the trains to be comfortable, reliable and a pleasure to use, meeting the highest standards internationally for passenger experience, noise reduction, and environmental sustainability. But companies interested in bidding for the train contract need to push the boundaries. We want to see innovation, creativity and ambition. The construction of these trains will also leave a legacy for this country, boosting skills, generating employment and strengthening the manufacturing supply chain. 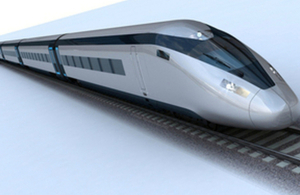 HS2 represents a once in a lifetime chance to rebalance the national economy. It will transform travel in this country, connecting eight of the 10 largest cities in the UK when completed, as well as improving capacity for customers and productivity for the economy. The priorities and needs of our future passengers are at the centre of our thinking. Quite simply we want every aspect of travelling by HS2 to exceed expectations - from the passenger experience in selecting their journey and getting information, to travelling through our stations, to the train ride itself. We challenge bidders to achieve this ambition. In total 25,000 jobs and 2,000 apprenticeships will be created during HS2 construction and HS2 Ltd has held discussions with UK-based suppliers to make sure they are in the best possible position to win contracts. Starting from 2026, the trains will bring the benefits of high speed rail not only to the core network between London and the West Midlands, but also onward to places like Manchester, Glasgow, Liverpool, Preston and Wigan. The successful bidder will maintain the fleet from the dedicated rolling stock depot planned for Washwood Heath in Birmingham. The site will also be home to the HS2 Network Control Centre which will together create hundreds of skilled jobs. The contract to provide the initial fleet of trains will be awarded as a single package. Invitations to tender are expected to be issued to shortlisted bidders in spring 2018 with contract award following in late 2019. Future contracts will add to this fleet to provide trains for the second phase of the project in 2033.